Pharaoh ants are very small pests ranging between 1.5-2 mm in length. The body color ranges between yellow, orange and red. Pharaoh ants also have a distinct black shade to the abdomen. Pharaoh ants cannot survive in cold environments therefore theses pests are common in tropical environments, such as Sarasota and Bradenton. In their natural habitat, pharaoh ants prefer to live in the soil, but they do not build mounds. They like to nest in between objects such as rocks, woodpiles and dead leaves. Inside homes, pharaoh ants like to nest between bookshelves, cabinetry, behind appliances, behind baseboards and inside expansion joints under a concrete slab. During the Fall and Winter months, pharaoh ants will nest near artificial heat sources such as water heaters and refrigerators. Pharaoh ants can build large colonies consisting of numerous nests. The colonies vary in size from hundreds to thousands of workers. Some colonies have one queen and others will have many. The queen can live up to one year while the workers live a little over two months. It takes approximately 38 days for a pharaoh ant to mature into an adult ant. The queen can lay over 30 eggs per day, producing more than 11,000 offspring in a lifetime. At daybreak, pharaoh ant workers venture out of the nest to search for food. Once the worker discovers food, it immediately returns to the nest while leaving a pheromone trail. The pheromone trail alerts the other ants and leads them directly to the new food supply. Pharaoh ants will eat sweets, fats and proteins. They like variety in their diet and prefer to eat foods they have not recently consumed. Controlling pharaoh ants can be challenging because locating the colony is sometimes impossible because they hide their colony between tight spaces. When using insect growth regulators for ant control, focus on wall voids, cracks, crevices and near appliances. Baits are the ideal treatment for pharaoh ants. Locating the ant trail is paramount with baiting. 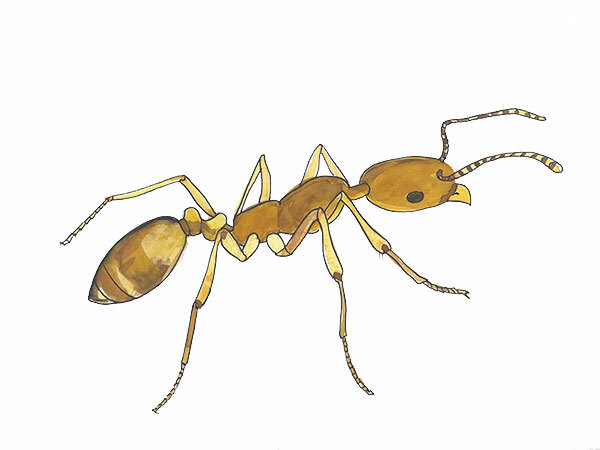 Pharaoh ants may have trouble locating the bait until it is placed directly in their pheromone trail. Workers will eat the bait feed it to the other ants in the colony, including the queen. It is important to check the bait regularly to make sure the pharaoh ants are still eating and sharing it. Sometimes the bait may take several weeks to wipe out the entire colony. Warning: Pesticide is poisonous and should be handled by a pest control professional. Always read the label and follow instructions before use. Please call us for a free inspection and get rids of ants in your home. We are very familiar with ant control Sarasota and ant control Bradenton. Cloud Termite and Pest Control is available to answer any questions you may have about indoor ant control and prevention.